Can Altay presenting at the Spaces of Exception roundtables during the opening weekend of the 4th Istanbul Design Biennial, A School of Schools. I was thrilled to be able to curate the public program of the 4th Istanbul Design Biennial, A School of Schools, as part of my role as a member of the biennial’s curatorial team. As a crucial part of our understanding of the “expanded” character we wanted to give the biennial, the public program was an active and intense part of the biennial’s effort, testing a variety of formats and experimenting with elements of duration, complexity and materialization. 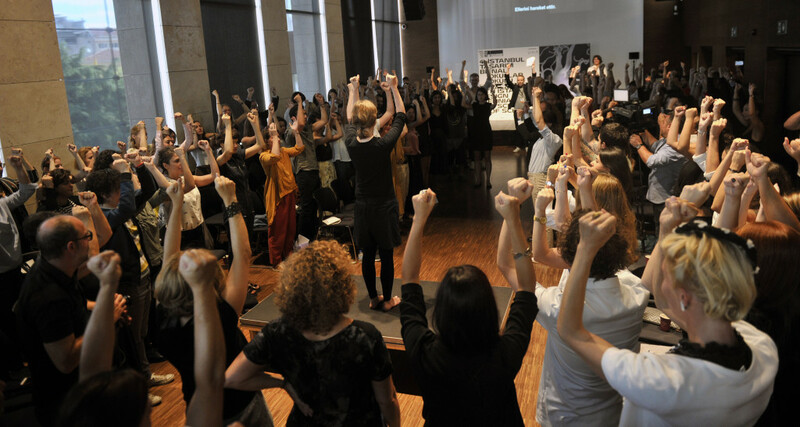 Taking place across the six venues of the biennial, the public program was also a way to involve a large local audience and bring several international practitioners to Istanbul, including some international schools who became temporary residents of the exhibition spaces, adding to the show and creating new work while there. In this way, the public program sought to expand and amplify the discussions started by A School of Schools. Performance by Vivien Tauchmann during the press conference of the 4th Istanbul Design Biennial, A School of Schools. Photo Ilgin Erarslan Yanmaz. 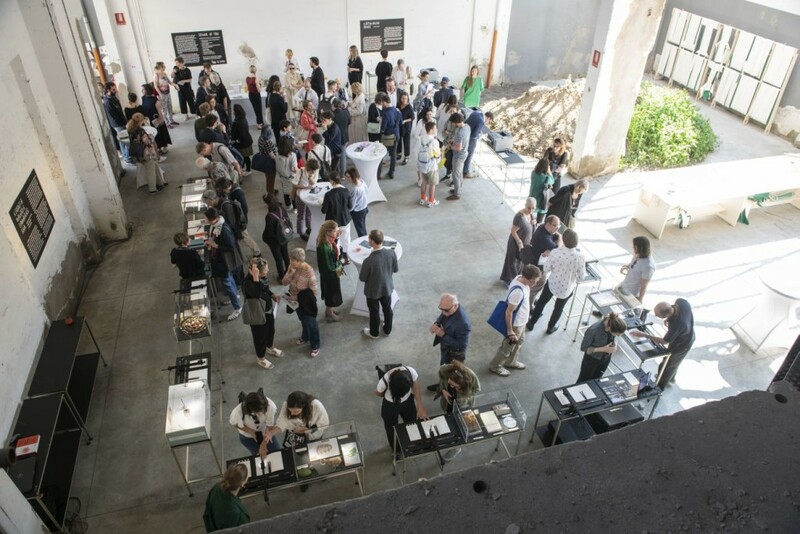 The 4th Istanbul Design Biennial, A School of Schools, has officially opened its doors to the public. 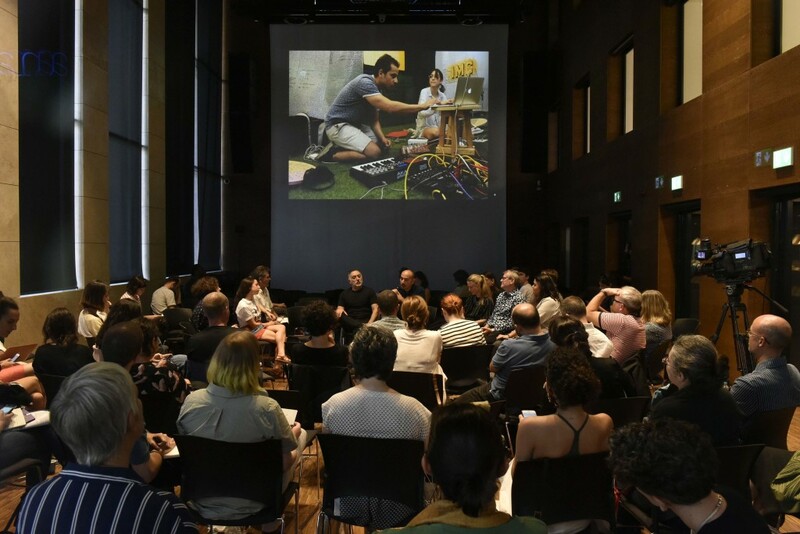 The Orientation Days on 20 and 21 September – open to professionals and other accredited visitors – kicked-off an intense series of events and formats, complementing the main biennial exhibition, which extended over six venues in the Beyoglu district of Istanbul. From 22 September to 4 November, A School of Schools will be free and open to the public. The biennial brings together projects from more than 100 interdisciplinary practitioners from across the globe. Six of the city’s most iconic cultural institutions in the Beyoğlu district—Akbank Sanat, Yapı Kredi Culture Centre, Arter, Pera Museum, SALT Galata, Studio-X Istanbul—will transform into “schools” where new ideas in relation to expanded notions of design and its role in contemporary culture are explored. The 4th Istanbul Design Biennial, A School of Schools, was present during Milan Design Week with a public presentation that took place at ALCOVA, amidst the School of Time installation by Z33. The director of the Istanbul Design Biennial, Deniz Ova, introduced the ambitions for the event, and the curatorial team – Jan Boelen, Nadine Botha and myself – anticipated some details of the biennial, which will open next 22 September in Istanbul. Additionally, we also announced a collaboration with Z33, who will bring School of Time to Istanbul as part of the biennial. We are looking forward to seeing you all in Istanbul in the Fall! View of the panel discussion at the 7th UABB in Nantou Old Town, Shenzhen. 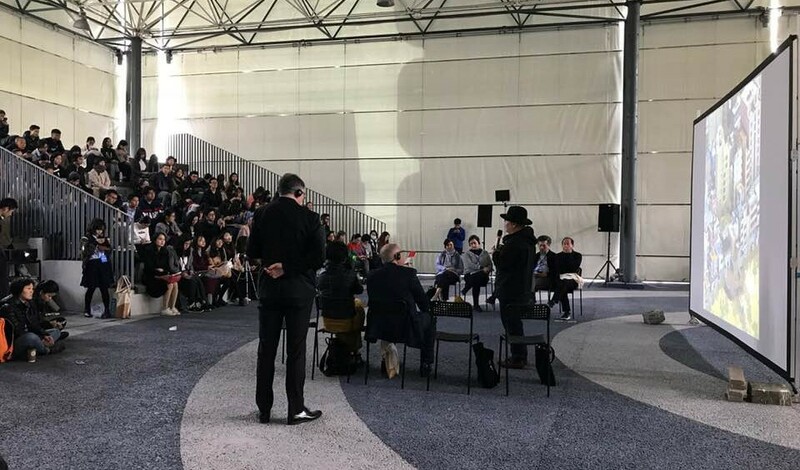 As part of a research trip for the 4th Istanbul Design Biennial, the biennial director Deniz Ova and I participated in a panel discussion at the opening weekend of the 7th UABB – Shenzhen/Hong Kong Bi-city Biennial of Architecture and Urbanism. Gathering Doreen Heng Liu, Ou Ning, Meng Yan, Liu Xiaodu, Hou Hanru, Jeffrey Johnson, Deniz Ova and myself, and moderated by Ole Bouman, the discussion centered on the vision behind the 7th UABB, titled “Cities Grow in Difference”, as well as how the format has changed and evolved throughout the previous editions. As international guests, we commented on how the UABB connects to other similar events and how the biennial format has changed in the past decade. It was an honor to sit among all these luminaries, and a very pleasant surprise to visit the UABB for the first time!